We’ll be celebrating our 10th year anniversary this year and I’m feeling thankful for the journey that we’ve made thus far. Still, there is room for us to grow and become better life partners to each other. And we’re constantly trying to think of ways to keep the flame burning. 9. Make a gratitude list for each other, and take turns to read it out one date night. 25. Plan a romantic getaway/staycation just for the both of you. 30. Diffuse some essential oils, turn down the lights, and give him a massage. 37. Plan a surprise date and pick her up after work. 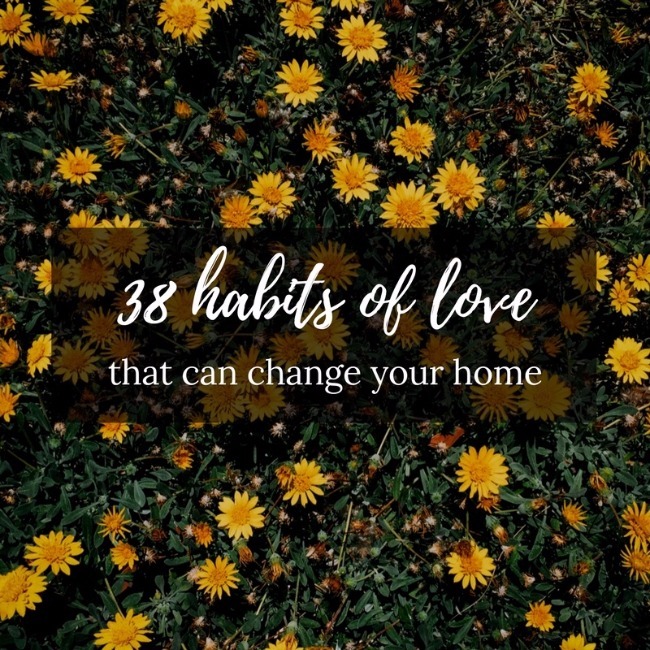 As part of my focus to be faithful in the small things, I hope to cultivate more of these little habits of love at home. What would you add to this list? 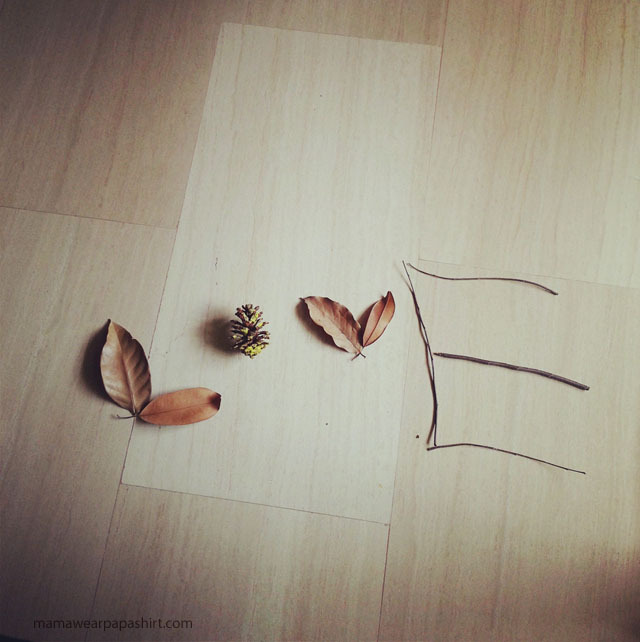 What are your favourite ways to show and receive love? Vera surprised me one evening with this drawing of the hubby and I. It had a bold caption: Love never fails. There were flowers in a vase on a table. A big cross stood out in the middle of the table. It reminded me of this verse in 1 Corinthians. I asked Vera why she chose to draw the cross. She said it means that Jesus is in the house. 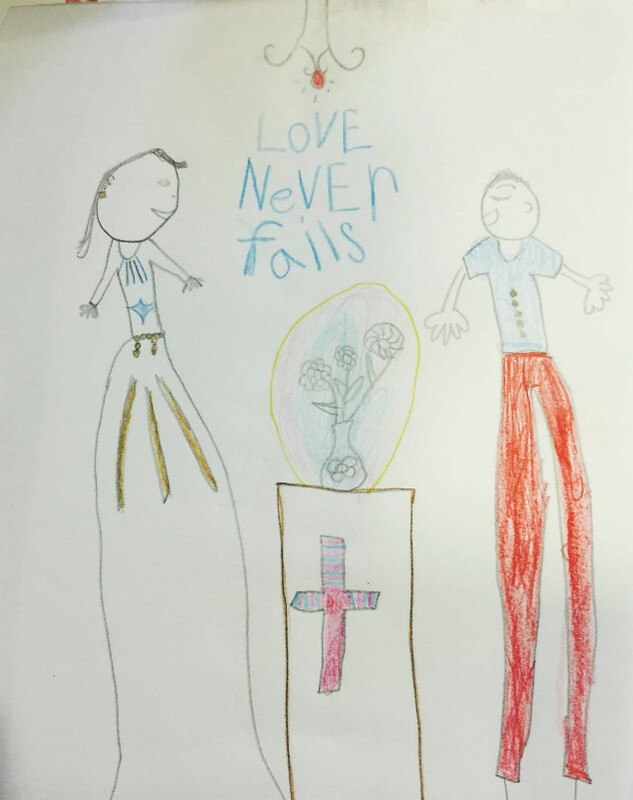 I then asked why she chose to write the words “Love never fails.” She said it was papa who gave her the idea. She originally had in mind some other words to write, but she thought daddy’s idea sounded better. I was glad for this gentle reminder to keep God in the heart of all things, including our humble home. As for everything else, Love never fails. His love, that is. Our human love may wane or fade or grow cold over time and trials. But His love never does. Occasionally, my little girl astounds me. This is one incident where I’m left deeply humbled. There are tantrums, and there are tantrums. JJ was having one of the latter and I was at the end of my rope. I felt like screaming. Instead, I walked away, feeling helpless and exasperated. I looked at Vera, and thought she might be able to help her little brother, so I asked her to go and talk to him. She went. She sat. She said some words. She gave him his water bottle and asked him to stop crying. The words she spoke probably echoed some of mine, uttered over the past two years. Her actions, like handing him his bottle, reminded me of my own. But her heart, was different. Where I had been harsh, she was gentle. Where I had been frustrated, she was calm. She told her little brother, “It’s okay, stop crying. Listen to mummy huh…” In a sweet, sing-song voice. I was stooping beside her, facing him. Him in his orange calm-down chair. Him with the red face, the heaving shoulders, the loud sobs. I could see, all of a sudden. 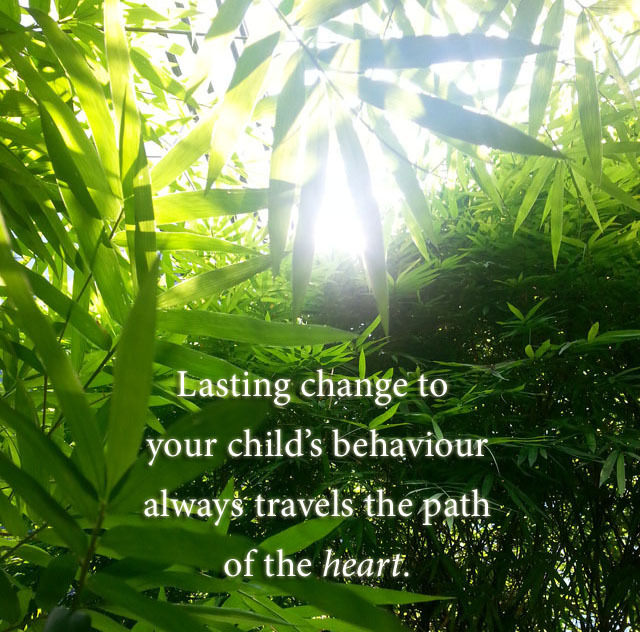 The frustration with dealing with a temperamental child often cripples my ability to love, despite my best attempts to do so. But Vera carries no such frustration. She is free from baggage. I simply asked her to help. And she did, in a way that she knows how. My girl (who’s really an angel in disguise) humbles me. She teaches me how to love, better, purer, with each ordinary day. She shows me how kind-hearted love ought to be. This is Little Lessons #28. 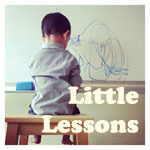 Grab our badge and link up your little lessons / reflections / learning activities below! You’ve given me many gifts throughout our marriage but today I’d like to single out two of these. Since our dating days, you’ve already been making me laugh. I guess that’s what attracted me to you in the first place. Sometimes it’s a silly joke, or the funny things you say or do. Then when we had our first baby, things got stressful for a long while as we adapted to the new life. I often had difficulty seeing the lighter side of things but you helped me along. And now as we settle into life with three, you recently cracked me up again. So hard it actually hurt my ribs a little. You’re also the zen one. My friends used to label me zen, but that was before kids came into the picture. You’ve taught and encouraged me to stay calm, and not shout or yell to get my way. Just the other night when JJ was acting up, you were just about to cane him. But I went in and started to speak to him in a low calm voice. And I believe that it somehow helped to calm him, and you, down as well. When we left the room, I felt a sense of peace. I was like, hey I can do this parenting thing without yelling. Granted I still have my moments, but I think it’s because of you that I’ve come this far. What is it they say about a partner bringing out the best in a person. Yeah I think something like that has happened around here. Every marriage needs a variety of ingredients to thrive. For me, the laughter and zen that you’ve brought to my life (and the family) have been both precious and practical. Of course then there’s the romance and communication aspects that could always have room for improvement. But I shall save those for another post. Thank you for making marriage and family life fun and calm for me. We’ve come a short distance, and we still have a long way to go. But I’m glad to be walking this road of life and love (plus a bit of crazy) with you. As parents, we tend to think after parenting for a few years that we are “experts” . That’s quite a scary place to be. When we think we know it all, we stop being humble, we stop learning. I’ve fallen into that trap too…Particularly as a parent blogger, the pressure to act like I’ve got it all under control is ginormous; it’s very real. So I’m thankful for the existence of real experts who dare to speak the truth. Most truths hurt. They don’t aim to flatter. They aim to reveal the points of failure or insecurity in our lives, not to put us down, but to help us grow and make changes that are most needed. I attended Paul Tripp‘s seminar at ARPC last weekend. And here are some of the truths that I picked up. 1. The target is the heart, because the problem is the heart. Parenting books and websites often dish out expert tips to deal with this and that behaviour. But as we’ll find, using external rewards, guilt, punishment, consequences, and threats work temporarily at best. I often focus on behavioural control too. I guess it’s easier to try to fix what we can see. But the heart of the matter is a matter of the heart. We need to draw the connection between their behaviour and the thoughts in the heart, in order to reveal the ugliness of what’s in there, and point them to the need to ask God for help. I tried this on Vera one day, and she was able to articulate her feelings. Specifically, she used the words “confused” and “sad” when I asked her how she felt when JJ had the chance to turn off the lights at bedtime, and she didn’t (and she started to whine because of that). She then went on to share that because it was something she liked to do too, but she doesn’t get to do it because of her brother. I haven’t tried this with JJ, and I think he’s not yet at the stage where he’s able to verbalise or describe his feelings. But I hope to try this soon nonetheless, even if I have to provide him with some words to help him along. 2. The battle is about authority. This battle is best fought when young. Daily battles about food, sleep, or whether to buy the toy or not, are not actually about food, sleep, and toys. It is about authority. Whenever our kids push the boundaries that have been set, they are challenging our authority. Sure, there are some things that can be negotiated and some that have room for compromise, and we don’t want to exasperate our toddlers with excessive rules or “No’s” with no reason as well. But when it come to the crunch, they need to know that parents have been appointed as authority figures in their lives. They need to learn appropriate submission to authority. 3. Parents have an ambassadorial authority. We are the visible representation of the invisible authority of God. So each time we exercise authority, it must be a beautiful picture of the authority of God. Questions to ponder: What picture of authority are we giving our child? What do they see in our face, tone of our voice, feel from our hand, when we exercise our authority? 4. Discipline is the other hand of love. Discipline is love. That is why we shouldn’t discipline out of anger, as it’s inconsistent and scary for a child. Discipline is about bringing our children from a place of danger back to the circle of safety. Its purpose is rescue and restoration, not to express irritation or anger. Children need firm, loving discipline. Discipline that is not careful and restrained hurts the child. Here are some tips from Paul on how we can exercise restrained, loving discipline. 5. It takes character to go after character. Parents need to examine ourselves too. 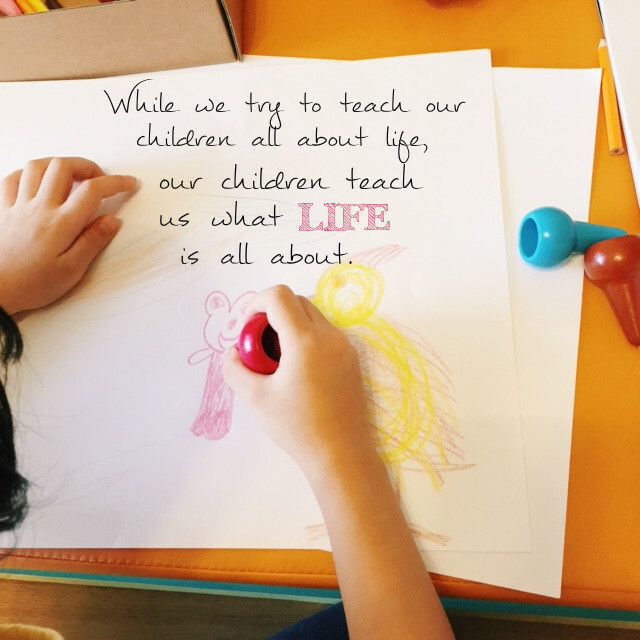 Perhaps one of the biggest lies that we’ve bought into is the belief in self-sufficiency – That somehow by trawling and accumulating all the modern parenting wisdom floating around on the internet, we are able to do it on our own. The truth is we all need grace to bring up children of character. And we need to be humble and open to correction ourselves. I’m really glad that I managed to attend this seminar; I’ve never picked up so many gems in one sitting! If you’re keen, you can check out his parenting books and DVDs here. Grab the button by copying the code below and pasting it into your blog post!